I was one of the chosen to receive the Vow VoxBox from Influenster which contained several free beauty goodies for me to test and share my personal opinions on. 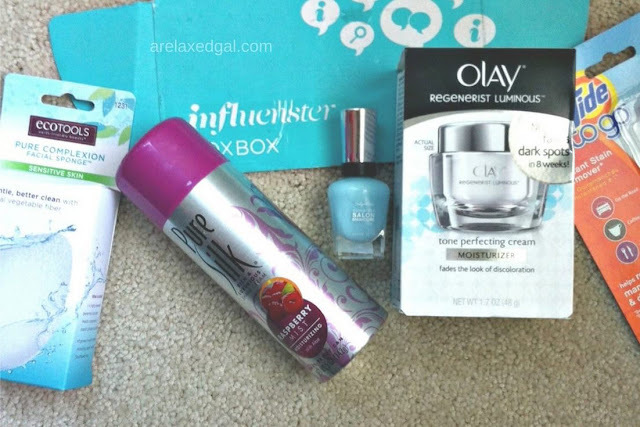 The products in the VoxBox included Olay Regenerist Luminous Tone Perfecting Cream, the EcoTool Pure Complexion Sponge, Pure Silk Moisturizing Shave Cream, Sally Hansen® Complete Salon Manicure nail polish, Tide to Go®, and Riley & Grey. I've used a few of the products and will be sharing my first impressions in this post. Description: "A fresh face is the first step to your complete wedding look. The new EcoTools Pure Complexion Sponge is handmade with 100% natural ingredients, including Konjac vegetable fiber, for a better clean that reveals smooth, refreshed skin. At the end of the special day, the unique shape of the sponge allows you to remove makeup with ease." My take: When I first saw this thing I was skeptical. It was hard and felt rough, two things I didn't want to put on my face. Nonetheless, I decided to give it a try by wetting it and putting my face wash on it. Boy, are initial looks deceiving. Once wet, the sponge softens up so much and it did exfoliate my skin, but not harshly or painfully. Afterward, my face felt smooth and was glowing. A definite win. They say you should replace the sponge every 1-3 months. Being my cheap self, I don't know that would purchase this again, but I would recommend trying it if you are looking for something to help with makeup removal and face washing. You may also like Can You Really Get Free Stuff With Influenster? Description: "Pure Silk Moisturizing Shave Cream with added aloe and extra moisturizers will keep your legs looking and feeling like Pure Silk with 7 fabulous varieties, your legs are sure to shine as you walk down that aisle." My take: I've used Pure Silk before, but it's been a while. I stopped buying shaving cream to save money and have been using old conditioners that I don't use on my hair anymore. Anyway, this Pure Silk is awesome! My legs felt extremely smooth, so smooth I couldn't tell I was wearing my skirt. The foam isn't drippy, but thick so it stays on your skin until you wash it off or shave it off. If using shaving cream is your thing, I recommend using this one. Description: "Fade the look of dark spots in 8 weeks with Luminous Tone Perfecting Cream. It's Brightening Complex delivers tone ingredients 10 layers deep into the skin's surface to help reveal pearlescent skin that glows." 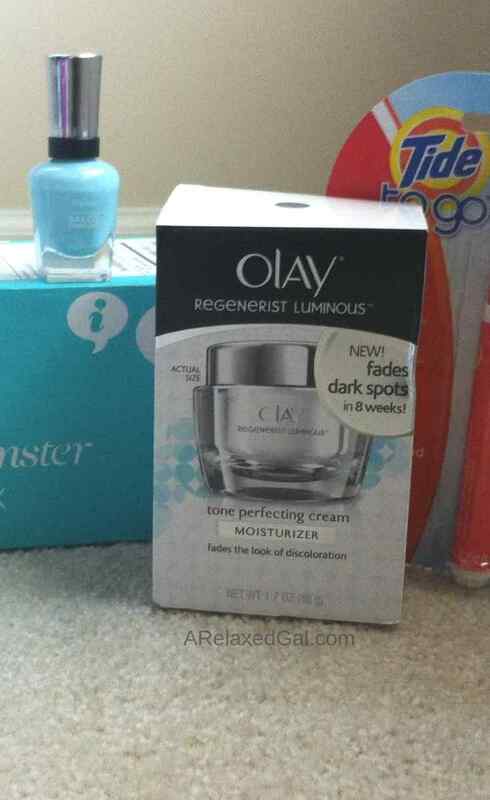 My take: I've only used the Olay Regenerist Luminous Tone Perfecting Cream once and in certain spots that have dark spots. I didn't use it all over my face, because I have sensitive skin and doesn't always take very well to new products. The cream has a beige like color to it but goes on clear. It also has a texture and doesn't feel too heavy on the skin. My one concern is the fragrance. Those with sensitive skin that doesn't take well to fragrances might not care for this. Does it work? After 24 hours I can't tell but will give you an update in a few weeks. Description: "7 Salon Benefits in 1 Bottle. Skip the salon, get the results. Don't settle for just color when you can get a base coat, strengthener, growth treatment, salon-inspired color, top coat, chip-resistance and a gel finish all in one bottle. Featuring the unique precision brush for a flawless finish and patented Vita Care technology for advanced 10 day wear, more shine and nourishing care. Choose from 56 gorgeous shades." My take: The Sally Hansen Complete Salon Manicure is my new favorite nail polish. Living in a warm climate I wear open-toe shoes several months out of the year so I like to keep my toes looking good. When I was using other nail polish brands I had to touch up to change my polish once a week. Not with the Sally Hansen Complete Salon Manicure. It lasts two weeks or more which is great for my busy schedule and I don’t have to worry about how my nails look after a week. Description: "The #1 instant stain remover* and helps remove some of your toughest fresh food and drink stains. (*Based on sales.)" My take: The Tide to Go stick has been helpful for when I find the occasional, and surprising, stain when I'm on my way somewhere and can't turn back to go home and change. Description: "Seekers of inspiration for modern couples. Believers in love, laughter, and lunatics, they'll help you to craft your unique wedding website."